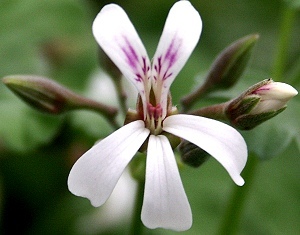 Nutmeg Scented Geranium makes a heavenly scented border in zones 9 and up, and a great summer bloomer for other zones. In Zone 8, during a very cold winter, it dies back but returns fairly reliably. 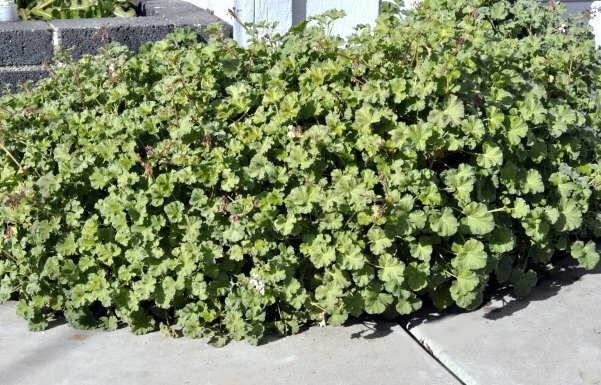 If the winter is milder, Nutmeg Geranium will stay evergreen and even bloom early in Zone 8. 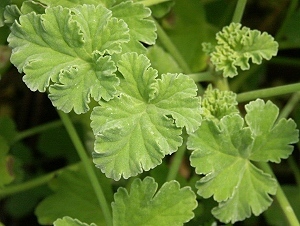 The picture above shows what a great landscape plant Nutmeg Scented Geranium is. These are planted in a ground level half circle. It is watered by drip and is in an extremely hot location. To the Nutmeg Scented Geranium intermingles with another prolific bloomer, Santa Barbara Daisy. 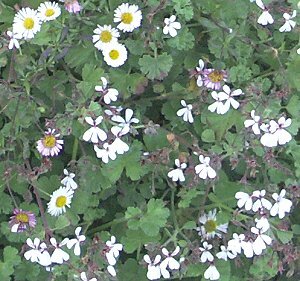 Both have small leaves and white flowers making them a good choice to grow together. They are especially nice in a moonlight garden.